Interior Sewing By Lisa is a window treatment design and fabrication studio serving Northwest Iowa and the Iowa Great Lakes, since 2002. 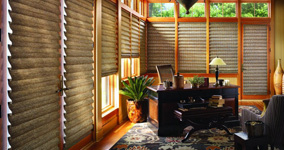 Lisa specializes in Hunter Douglas Window Fashions, custom draperies, bedding, drapery hardware, soft home furnishings, and an extensive fabric and trim selection. Whatever your need may be, Lisa can assist you from start to finish, providing a free in-home consultation and complimentary installation. Interior Sewing by Lisa strives to provide quality products with outstanding details, helping clients with the final touches that can turn an ordinary house into an extraordinary home that reflects your style.